This book is a must-read for anyone who loves suspense and potentially unreliable narrators. So many twists and turns, and that ending! Now, I want to read Jackson's latest book, Monday's Not Coming. 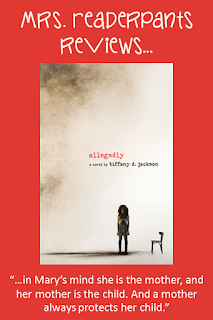 This review is spoiler-free, but if you have not yet read Allegedly, I recommend you not read too many reviews. Trust me, this book is best read without knowing anything about it. SUMMARY: When she was nine years-old, Mary B. Addison killed Alyssa, a 12-week old baby in Mary's mother's care. Allegedly. Now, age 15, Mary lives in a group home for teens found guilty of serious crimes. When Mary finds out she is pregnant, she knows social services will take her baby from her. So now, Mary must do what she could not do when she was nine. She must tell the real story of what happened the night Alyssa died. REVIEW: Let me first promise that I will keep this review spoiler-free. For that reason, I won't be able to say much about specifics, but I can give you general ideas about writing and characters. It's a page-turner. I started reading Allegedly on OverDrive, but I did not start it until the last day of my OverDrive loan. I got about halfway through, and the book expired. Noooo! I immediately bought it on Kindle because I could not stand to wait for the hold to come back to me. I finished it that night. There are two major characters in Allegedly, plus a whole bunch of secondary characters. Mary B. Addison narrates her story. I spend a lot of time trying to decide if I could trust her as a narrator. I mean, she's been convicted of killing an infant, who she says she loved. Throughout the story, experts and people involved in the case weigh-in on Mary's psychological state and the circumstances leading up to Baby Alyssa's death. Some of the experts support Mary, and some condemn her. All are opinions, and some of them conflict with each other and with what Mary tells the reader. The second major character is Mary's mother Dawn. She is a real piece of work, and Mary alternately hates and loves her. Huge Kudos to debut author Tiffany Jackson for making Dawn such a believable and complex character. There are many unanswered questions about Dawn's story, even at the end. At the crux of this heartbreaking story is relationships between mothers and children. We have Mary's relationship with her own mother, plus her developing relationship with her unborn child. There is also Alyssa's mother's relationship with her daughter, as well as with Mary herself. There is Mary's mother's breakdown after the SIDS death of Mary's little brother, Junior. Mary also meets two other women during the story, who in some ways also serve as mother-figures for Mary. All these mother-child relationships weave together, driving Mary's decisions and making her who she is. It's brilliant, beautiful, and heartbreaking all at the same time. Allegedly also brings up important questions about race, poverty, and the juvenile justice system. What does happen to child criminals? What is the best way to deal with very young murderers? Can they be rehabilitated? Are they capable of leaving correctional facilities and having normal lives as adults? Why are so many criminals poor minorities? What can be done about abuse and mismanagement in social services? 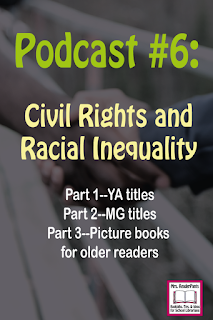 Huge questions with no good answers, but all would make for some excellent discussions with high school students. THE BOTTOM LINE: A suspenseful, complex psychological thriller with no easy answers. A must for any high school library. Be sure to booktalk it--that boring front cover doesn't do this book justice. STATUS IN MY LIBRARY: On-order. I've already booktalked this as part of my "Mrs. Collazo is currently reading..." during library booktalking sessions. It's going to fly off the shelves when it arrives.